Billiard | Pool Tables are engineered with six pockets — one in each corner and two centered on the longs sides. 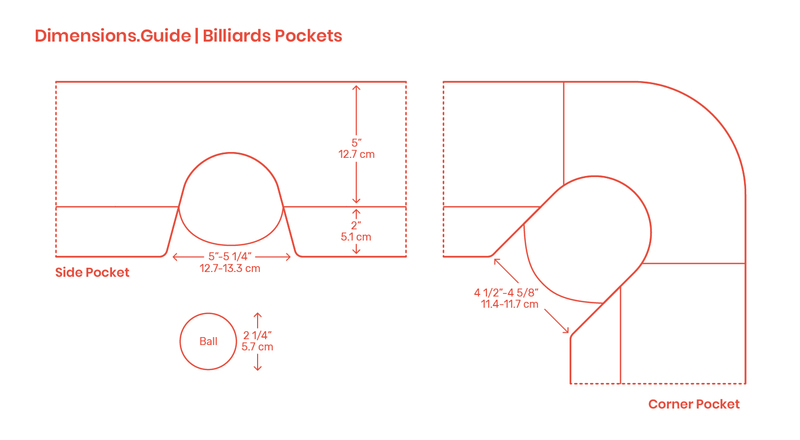 Pockets, varying in design from simple drop pockets to elaborate ball returns, differ in shape and dimension between Corner Pockets and Side Pockets. Corner pockets have openings sized the width of two billiard balls (2 1/4” | 5.7 cm) at 4 1/2”-4 5/8” | 11.4-11.7 cm. Side Pockets have mouths 1/2” | 1.27 cm larger than corner pockets for a total opening of 5”-5 1/4” | 12.7-13.3 cm. The perimeter of a pool table is made up of inner cushions with depths of 2” | 5.1 cm attached to outer rails of 5” | 12.7 cm.